An outbreak of severe weather is likely this weekend in the South, including the threat of tornadoes, a few of which may be strong. Severe thunderstorms are most likely from eastern Texas into southern Arkansas, northern Louisiana and western Mississippi. Strong tornadoes, damaging winds, hail and locally flooding rainfall are all possible in these areas. 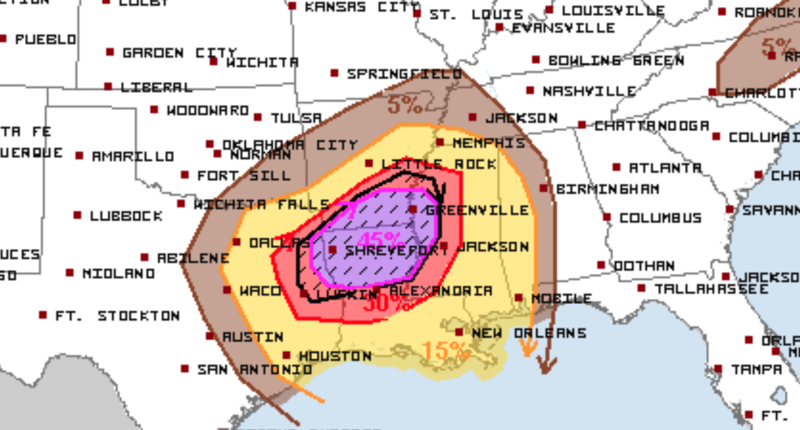 The area shaded in purple in the map below shows where the tornado threat is most significant. Saturday night into early Sunday, severe thunderstorms may sweep ahead of the cold front into Tennessee, eastern Mississippi, southeast Louisiana and western Alabama. Damaging winds and tornadoes are likely. The Storm Prediction Center has issued a Moderate Risk for Saturday into Saturday night! As an upper low/trough shifts northeastward across the Great Lakes into eastern Canada, an evolving trough pivoting around the western and southern fringe of this system will shift out of the southern Rockies and across southern Plains Saturday/Saturday night. In response to this system, a surface low — initially expected to reside in the vicinity of the Texas Hill Country — will strengthen as it shifts northeastward. By the end of the period Sunday morning, the low should reside in the vicinity of the confluence of the Ohio and Mississippi Rivers. Trailing from this low, a cold front will sweep across east Texas to near the Sabine River by sunset, and then continue eastward across the lower Mississippi River into Mississippi and eventually western Alabama. Widespread thunderstorms — including potential for a substantial severe weather event — are expected. 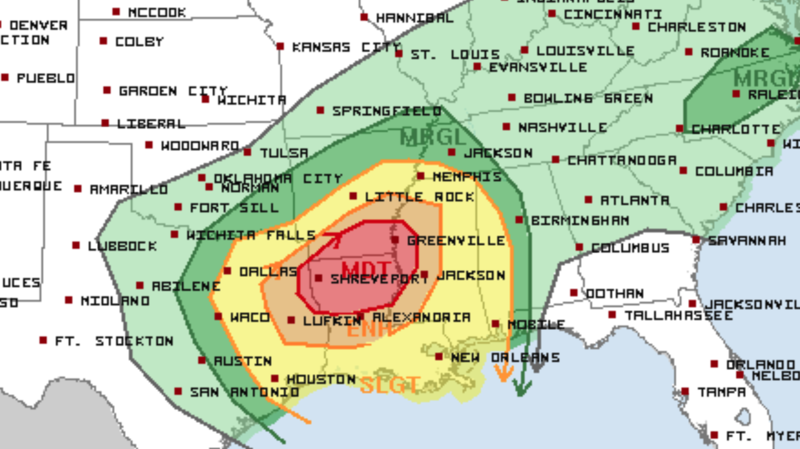 A potentially significant severe weather episode is expected to evolve across portions of the south central U.S. — focused from the Arklatex to the lower Mississippi Valley area, as a seasonably strong southern-stream storm system advances across the region. With a moist low-level airmass within an evolving warm sector undergoing ample daytime heating, mixed-layer CAPE in the 1000 to 2000 J/kg range is expected to evolve by early to mid afternoon. Increasing ascent associated with the eastward advance of the upper system should result in an increase in convection by early afternoon. CAM guidance varies from model to model, but general consensus appears reasonable — in that a band of storms will develop near the front, with some linear/upscale growth with time, while more cellular convection evolves ahead of the band. At this time, the banded convection appears likely to evolve across east Texas, with the more cellular storms affecting northern Louisiana and southern Arkansas by mid afternoon, and then spreading across the Mississippi Delta region into western Mississippi by mid to late afternoon. Given the very strong wind field accompanying this system, with flow veering/increasing with height from southeasterly to south-southwesterly, and reaching 60 to 70 kt at mid levels, well-organized rotating updrafts will likely evolve within several cells. Along with locally damaging winds and hail, strong tornadoes may also occur, within a few of the most intense storms. Convection will continue spreading eastward through the evening and into the overnight hours. While the pre-frontal, cellular convection should diminish overnight, a semi-organized band of storms — with embedded rotating updrafts and continued severe/tornado potential — will cross the central Gulf Coast states through the end of the period. Models forecast that the eastern fringe of a warm front associated with the developing south-central U.S. storm system will lie across the Carolinas/Virginia vicinity during the day. With some heating of a moist low-level airmass yielding around 1000 J/kg mixed-layer CAPE during the afternoon, scattered/diurnally driven thunderstorms are expected. While not excessive, shear — aided by 35 kt mid-level west-southwesterlies — will be sufficient for storm organization, and thus risk that a couple of storms reach severe levels. Hail and gusty/locally damaging winds would be the primary severe risk, before storms weaken into the evening hours. Stay Tune To LiveStormChasers.com for more updates!